Have had this stamp set for a little while now, and this is the first time it has seen ink! I know thats disgraceful, so today I set about making amends! 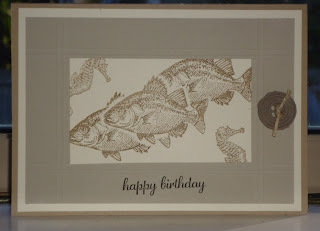 Our eldest son's birthday is today and he is a mad fisherman and knew he would love this card, anything at all to do with fishing and her is there. The card base is Crumb Cake, layered with Very Vanilla and Sahara Sand. I scored a border at 5/8" and 3/4" around all sides of the Sahara Sand to make a frame for the main image. I made a mask of the fish, stamped my focal fish and off stamped the other two fish using Soft Suede. Then I stamped a little sea horse on the diagonal corners of the Very Vanilla card stock. 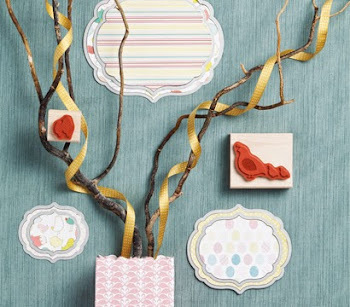 The sentiment is from the Express Yourself Hostess set and that was also stamped in Soft Suede. I seem to find myself reaching for this set all the time now, as the sentiments are so versatile. The other day when I was playing with my Simply Pressed Clay and the Simply Pressed Blossoms and Buttons Molds I made some coloured buttons. This one is believe it or not has been coloured using Early Espresso re-inker, I didnt use much at all, because I didnt want to make it too dark, so I began lighter. I really like the way the colour has come out on the faux button, which I attached to the side of the card with Hemp Twine. I have tried several ways to get the buttons particularly out of the molds and really the easiest way is to pop the mold into the freezer for 15 mins and they just pop out and stay in shape! Another lovely simple card for a male of any age! Till next time, Happy Stamping. please visit my blog .. This is one of my favourite sets Gwen. I love the colours you have used and also the way you have overstamped the images. I have to agree, making the flowers and buttons with the new Clay is quite addictive. So many variations. I'm sure your son was very happy to receive such a beautiful card.